Korn at the 2006 MTV Asia awards. Korn (sometimes written as KoЯn to fit their logo) is a Grammy Award-winning band from Bakersfield, California. The band was first called 'Creep' and had another singer. People often say they created the nu metal genre. Along with other bands of the time, they were influences for a wave of nu metal, alternative metal and rap metal bands through the mid 1990s and early 2000s, helping Limp Bizkit (who were discovered by Korn themselves) and Slipknot more than other bands. Despite this, Korn have been quoted for disliking the term and even being called 'metal'. 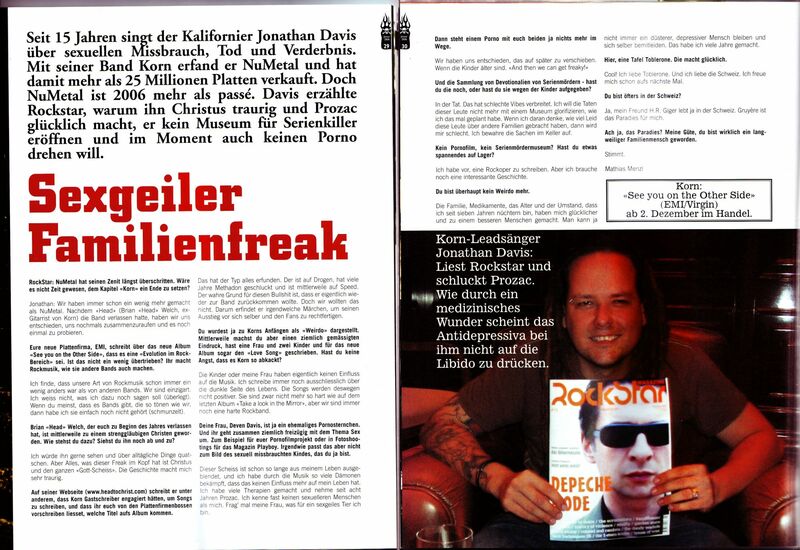 Jonathan Davis has said that Korn's music can not be classified and that it contains many other influences besides simply 'metal'. The official review on the iTunes Store for their first album goes as far as saying that Korn "hate the term". Their first album was first sold in 1994 and also called KoRn. Since then, Korn has sold over 35 millions records worldwide - including 16,5 millions in the U.S., making them one of the best-selling metal acts of the last twelve years. The band's catalogue consists of seven platinum studio albums in a row, one platinum compilation album, and seven consecutive debuts (including Greatest Hits, Volume 1 compilation album) in top 10 of Billboard Top 200 best selling albums. Korn has been selected for 6 Grammys, and won 2 such awards. 8 of their albums has been awarded as multi-platinum, despite only part of them being on Billboard. ↑ "www.showtimetickets.com". Mention of sales. This page was last changed on 28 March 2019, at 23:50.